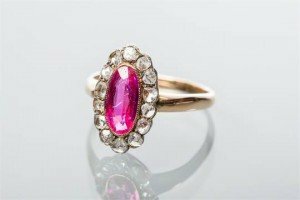 A ruby and diamond cluster ring with a central oval ruby surrounded by rose cut diamonds, in eighteen carat yellow gold. 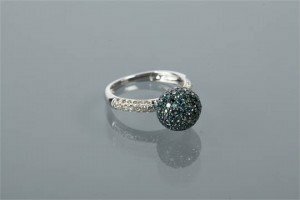 A blue and white diamond dress ring the spherical setting with pave set blue diamonds, on white diamond shoulders, hallmarked nine carat white gold. 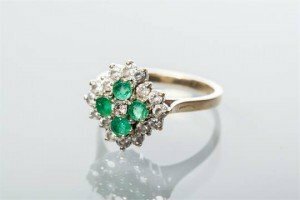 An emerald and white gem cluster ring set with four round emeralds surrounded by brilliant cut white gems, in nine carat yellow gold. 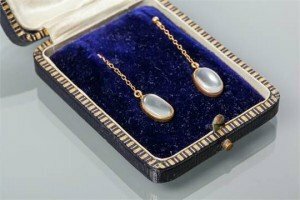 A pair of moonstone drop earrings, each set with an oval moonstone suspended on a gold chain, unmarked. 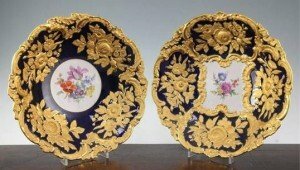 Two Meissen outside decorated plates and a similar Berlin outside decorated plate, each painted with birds in landscapes to the centre, the Meissen examples with insects, shell and scroll moulded borders, underglaze blue crossed swords mark with double incised marks, 22cm, the Berlin plate with borders of birds and ozier moulded and gilt scrollwork decoration, incised mark to blue sceptre and later enamelled Dresden, 21.5cm. 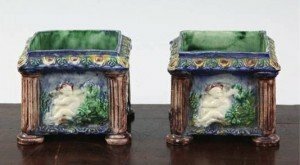 A Paris porcelain Empire style inkstand, second half 19th century, of rectangular form, painted with oblong reserves of floral bouquets in gilt scrollwork cartouches on an apple green ground, the raised centre with a pair of lidded inkwells and a central lidded sand pot with four quill holders, standing on four lion paw feet, in Empire style. 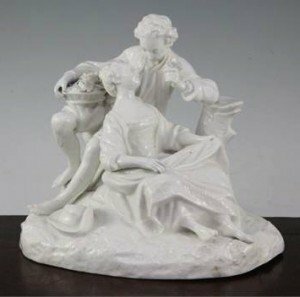 Two Meissen figures, late 19th and early 20th century, the first of a girl seated on a rock and scrollwork base, underglaze blue crossed sword marks and incised model no.2567, 12.5cm, repaired arm, the second a cherub holding a basket of flowers on a scrollwork base, underglaze blue crossed swords mark and incised model no.B50, 9cm. 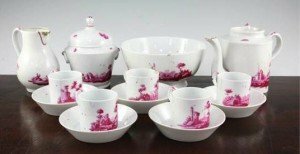 A Niderviller puce camaieu painted twenty piece part coffee set, late 18th century, each piece painted with figures in topographical landscapes with scattered insects, to include a coffee pot and cover, sucrier and cover, a slops bowl, a milk jug, nine coffee cans and five saucers. 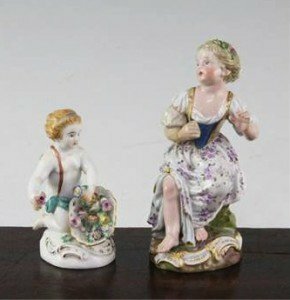 Two similar Meissen floral dishes, 20th century, each painted with a floral bouquet to the centre within gilt moulded floral bouquet borders on a cobalt blue ground, underglaze cross swords marks and impressed marks. 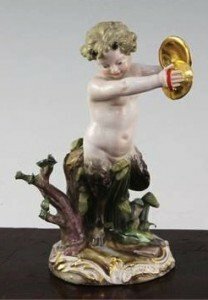 A Meissen figure of a satyr playing the cymbals, late 19th century, standing by a tree stump with foliage on a scrollwork base, underglaze blue crossed swords marks. 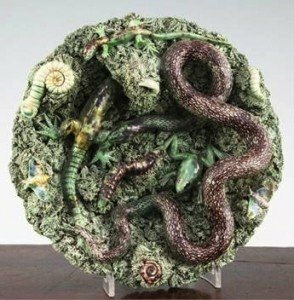 A Caldas Rainha Palissy style amphibian and reptile dish, late 19th century, modelled with a snake biting a lizard with another lizard, insects and a frog on a shredded ground, impressed mark. 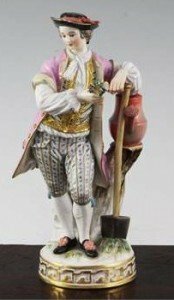 A Meissen figure of a gardener, late 19th century, holding a posy of flowers in his right hand and leaning upon a spade and a watering can resting on a tree stump, gilt key fret border to the circular base, underglaze blue crossed swords mark. 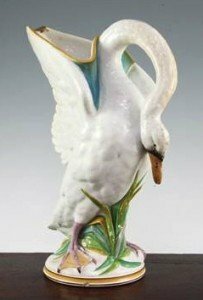 A Wedgwood earthenware ‘swan’ jug, mid 19th century, modelled as a swan, the handle formed as its neck and the spout its wings outstretched together, standing on a circular base modelled with rushes, impressed mark Wedgwood. 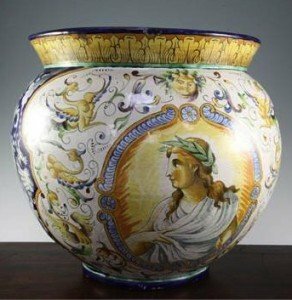 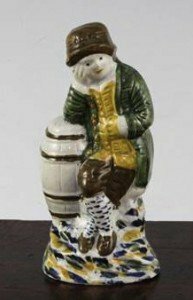 A Prattware figure of a young boy leaning on a barrel, late 18th century, wearing a hat, a green waistcoat and on a blue ochre and green mottled base. 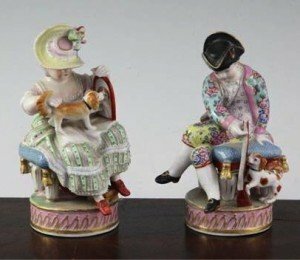 A pair of Continental porcelain groups of a lady and gentleman, late 19th century, the first modelled as a gentleman seated, holding a gun, a dog by his side, the second a lady holding a mirror with a painted reflection of her dog, seated on a stool, pseudo underglaze blue crossed swords marks. 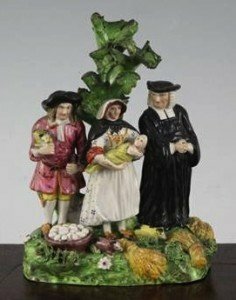 A pearlware ‘The Tithe Pig’ group, early 19th century, the three figures standing before a tree, label for Boswell & Ward Dealer’s, Piccadilly W1, 16cm. 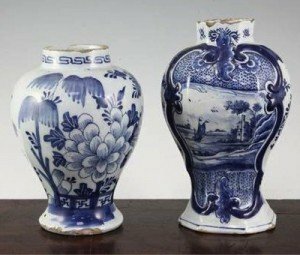 Two Delft blue and white vases, late 18th century, the first of hexagonal baluster shape painted with a ship on a river within a leaf scroll cartouche, 20cm, the second of baluster form painted with Chinese style fence garden and flowers.